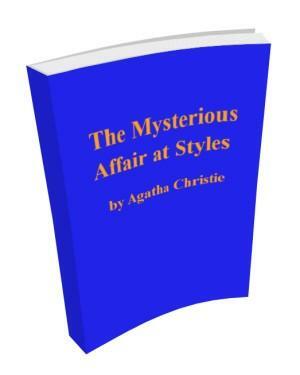 The Mysterious Affair at Styles is a classic mystery fiction by Agatha Christie. Start reading here then download the free eBook (free pdf). “The mater will be delighted to see you again–after all those years,” he added. Their country-place, Styles Court, had been purchased by Mr. Cavendish early in their married life. He had been completely under his wife’s ascendancy, so much so that, on dying, he left the place to her for her lifetime, as well as the larger part of his income; an arrangement that was distinctly unfair to his two sons. Their stepmother, however, had always been most generous to them; indeed, they were so young at the time of their father’s remarriage that they always thought of her as their own mother.